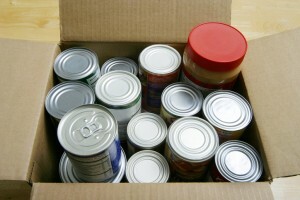 Storing food in the case of a disaster is a necessary part of preparedness. However, it is always an ominous task to begin, especially if you have little knowledge which foods have the longest self-life and how to store them properly. But, have no fear! We have compiled a list of tips and tricks for you to begin stocking up and storing today! A good estimation, for example, would be 25lbs of wheat, white rice, corn and other grains for one adult per month. For dry beans, 5lbs will last one adult for one month. The ideal storage temperature for long-term storage is 75 degrees Fahrenheit, or lower if possible. If the area does get hotter, be sure to rotate products to maintain quality. Keep the food in a dry area raised off the floor to allow for proper air circulation. It is also best to store items in a dark area, as light can make food go bad faster. Since most of these requirements fit either a basement or attic, be sure to protect your food from rodents and insects by storing things in foil pouches and airtight plastic bottles and bins. A good moto to live by when storing food is eat what you store and store what you eat. If you are eating your stored food every now and again it will force you to inspect your food. Another benefit of rotation and eating your stored food is that it teaches you to cook using different ingredients you are used to, such as dehydrated vegetables. Come join us at Reams for our case lot sale this week and stock up on some products perfect for long term storage.